B en’s Bus operates shared transfers from Geneva Airport to Tignes every Saturday & Sunday of the winter ski season. We’ve been running low cost transfers to Tignes from Geneva Airport for 10 years. Our network includes shuttles from Grenoble Airport to Tignes & Lyon Airport to Tignes. We stop at Tignes Val Claret, Tignes Le Lac, Tignes 1800 & Tignes Les Brevieres. 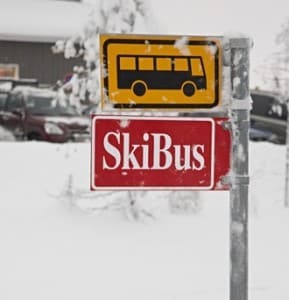 Although we have the cheapest ski transfers, our staff will ensure you have a safe and comfortable journey up the mountain. We usually transport passengers in coaches, which reduces your carbon footprint. A transfer from Geneva Airport to Tignes with Ben’s Bus will cost you £87pp for a Return and £50.50pp for a Single. With our group discounts, you could pay just £73 Return, £43.50 Single! We don’t charge anything extra for carrying skis. 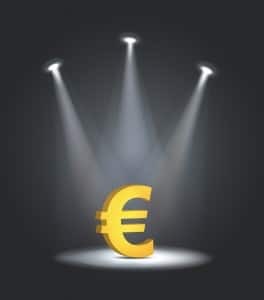 That’s amazing value for money for the level of service we offer. 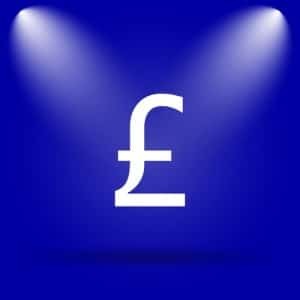 See our PRICES Section below to see more details or take a look at our Prices Page. 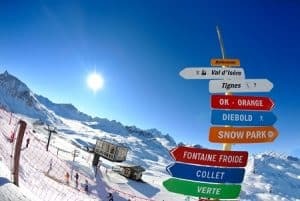 We’re sure you won’t find a cheaper way of getting from Geneva Airport to Tignes for your ski holiday. 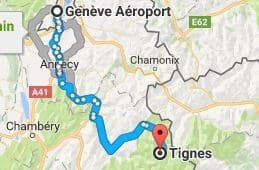 The transfer time from Geneva Airport to Tignes Les Brevieres, the first Tignes resort, is about 3 hours 15 minutes, depending on the date, time of day, the weather and traffic. We allow more time for the journey when we know travel conditions may be bad. The distance from Geneva Airport to Tignes Le Lac is 175km (109 miles). We have up to 7 well timed buses every Saturday. Expand the section “BUS TIMES” below to see more details about our bus timetable. Our vehicles usually take the most direct route via the A41 motorway and the N90 national road through Annecy, Ugine and Albertville before climbing the D902 mountain road to Tignes. Our service stops at convenient places in Tignes Les Brevieres, Tignes 1800, Tignes Le Lac and Tignes Val Claret. You can select any of these resorts when you make a booking with us. Expand the section “BUS STOP LOCATION” below to see a map of our stops in resort. You can also see information about the local free in-resort shuttle buses which can take you onto you accommodation and get access to the interactive maps of the resorts. Good snow reports can be found at the snowforecast website. Or check out the Tignes webcams to see the current snow conditions. Find more information at the Geneva Airport website, our Geneva Airport FAQ’s page or our Geneva Airport page. The transfer time between Geneva Airport & Tignes Les Brevieres is usually between 3 hours to 4 hours. These times are approximations. We allow extra time on certain dates & certain times of the day when we know the traffic may be bad. With years of experience driving this route, we know how long to allow for the journey depending on the time and date of the transfer. Once you put your details into our online booking system, we will show you a list of the available bus times. For Tignes 1800 it takes another 10 mins, for Tignes Le Lac another 25 minutes and for Tignes Val Claret another 35 minutes. From Geneva Airport we pick up and drop off at the stops marked below. Please ensure you are at the stop 10 minutes before departure time to allow us to pack your luggage onto the bus. Our vehicles will have signs in the window & our reps will be on hand to assist you. Please make sure you get on the correct bus as we have buses going to other Airports too!! The maps below will be shown on your e-Ticket along with the pick up time. 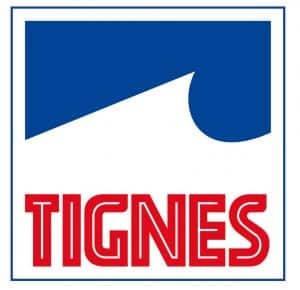 Click the following link to see the Tignes Tourist Office map of the resort which will help you find your accommodation in Tignes. The free shuttle buses depart from or very close to all of the Ben's Bus stops. On the North Eastern side of the village, just above all of the buildings, is a big car park. The GPS coordinates are 45.457455, 6.901943 (45°27'26.8"N 6°54'07.0"E) and you can see it on google maps here. At the main bus station, the "Gare Routiere", in the centre of the village. The GPS coordinates are 45.469747, 6.907510 (45°28'11.1"N 6°54'27.0"E) and you can see it on google maps here. On the roundabout on the main road going down to Bourg St Maurice is a bus stop. The GPS coordinates are 45.495607, 6.927202 (45°29'44.2"N 6°55'37.9"E) and you can see it on google maps here. On the road out of the village, on the left there is a large parking area. The GPS coordinates are 45.510447, 6.919145 (45°30'37.6"N 6°55'08.9"E) and you can see it on google maps here.